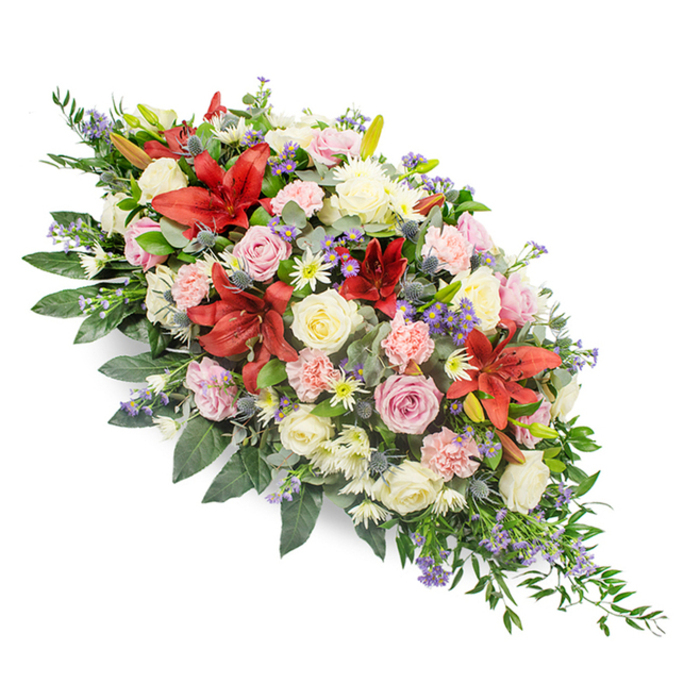 Let us deliver your wishes for peace and heartfelt sympathy with a lovely spray made of fresh and vibrant flowers including roses, lilies and chrysanthemums. The arrangement is delicately framed by fresh greenery. In all the time I have bought flowers, it was usually from my local florist. However for my best friend's funeral, I wanted it to be something special so I ordered online. I was not disappointed. The flowers were nothing like my local florist would have. I'm very pleased with the state of the flowers. You definitely know how to arrange the flowers and pack them safely. Will use your services again in the future. Your spray looked very beautiful and the family of the deceased appreciated our kind gesture. Good florist for sympathy flowers! Timely delivery, fair price and a wonderful customer service. Couldn't have asked for more. Well, I must say the arrangement was magnificent. As a whole, ordering from this company was very easy and care-free.